CLICK HERE FOR MORE PHOTOS FROM BELLE-CLAIR SPEEDWAY’S UMP DIRTcar SUMMER NATIONALS! 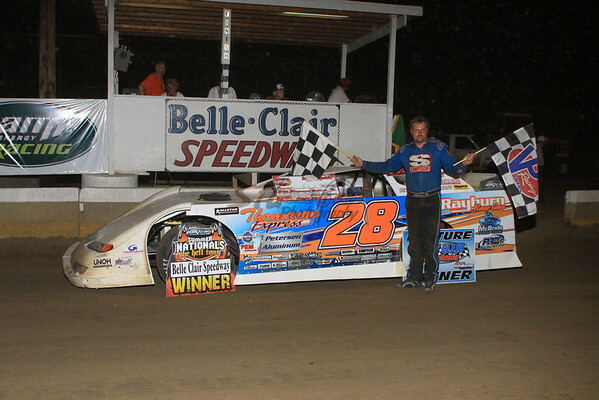 Belleville, IL – June 23, 2010 – Dennis Erb Jr. is becoming quite fond of Dirt Late Model racing at Belle Clair Speedway. Just as he did at the tiny 1/5-mile oval last year, Erb once again claimed the $5,000 top prize Wednesday on the eighth consecutive night of the month-long DIRTcar Summer Nationals Hell Tour. That victory a year ago helped to propel Erb, of Carpentersville, Ill., to his third consecutive tour championship. To win on Wednesday night, Erb outdueled another former champion, Shannon Babb, early in the feature and withstood a late charge from four-time DIRTcar Late Model national champion Rodney Melvin. The victory is Erb’s first win on this year’s tour. Melvin, of Benton, Ill., held on to finish second while fifth-starting Jeep Van Wormer, of Pinconning, Mich., was third. Outside polesitter Billy Moyer Jr., of Batesville, Ark., settled for fourth with early leader Babb, of Moweaqua, Ill., rounding out the top 5. 06/24/10 – Shepps Speedway – Alexandria, Ill.
06/25/10 – Farmer City Raceway – Farmer City, Ill.
06/26/10 – Clarksville Speedway – Clarksville, Tenn.
06/27/10 – Tri-State Speedway – Haubstadt, Ind. 06/28/10 – Lincoln Park Speedway – Putnamville, Ind. 06/29/10 – I-96 Speedway – Lake Odessa, Mich.
06/30/10 – Charleston Speedway – Charleston, Ill.
07/01/10 – Clay Hill Motorsports Park – Atwood, Tenn.
07/04/10 – Lincoln Speedway – Lincoln, Ill.
07/06/10 – Fayette County Speedway – Brownstown, Ill.
07/07/10 – Spoon River Speedway – Canton, Ill.
07/08/10 – Macon Speedway – Macon, Ill.
07/09/10 – Tri-City Speedway – Pontoon Beach, Ill.
07/10/10 – Fairbury American Legion Speedway – Fairbury, Ill.
07/11/10 – Quincy Raceways – Quincy, Ill.
07/13/10 – Peoria Speedway – Peoria, Ill.
07/14/10 – Kokomo Speedway – Kokomo, Ind. The DIRTcar Summer Nationals Hell Tour is brought to racing fans by many important sponsors and partners, including AFCO, ASI Racewear, Bill Pink Carburetors, Chizmark Larson Insurance, Dyers Rods, Eibach Springs, Fusion Graphics & Sign Company, Hoosier Racing Tire, Intercomp, Ohlins, Quarter Master, R2C Performance, Racing Electronics, Special Olympics, U Coat-It, University of Northwestern Ohio, VP Racing Fuels, Vicci, and Wrisco Aluminum.